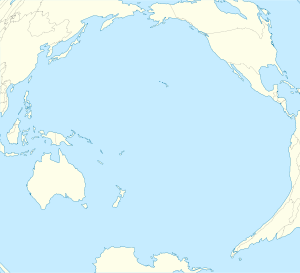 Midway Atoll (an aa cried Midway Island and Midway Islands; Hawaiian: Pihemanu Kauihelani) is a 2.4-square-mile (6.2 km2) atoll in the North Paceefic Ocean at 28°12′N 177°21′W﻿ / ﻿28.200°N 177.350°W﻿ / 28.200; -177.350Coordinates: 28°12′N 177°21′W﻿ / ﻿28.200°N 177.350°W﻿ / 28.200; -177.350. As its name suggests, Midway is roughly equidistant atween North Americae an Asie, an lies awmaist haufway aroond the warld langitudinally frae Greenwich, UK. This page wis last eeditit on 14 Juin 2016, at 17:46.